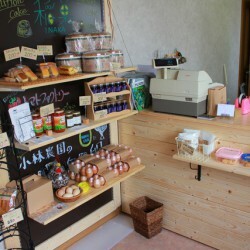 We sell rice flour chiffon cake and rice flour sweets using local ingredients. We use Atsuma-cho specialties, such as Atsuma-cho rice flour and buckwheat flour, haskap and tomatoes. Please try them. ◆Menu Rice flour chiffon cake　864yen Cheesecake（Plain, Haskap）　200yen Please consult us for birthday cakes made with rice flour.